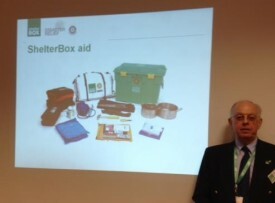 Keith McDavid, District Co-ordinator for Shelterbox, told Warwick Rotary club about recent developments with the charity, at lunch last week. 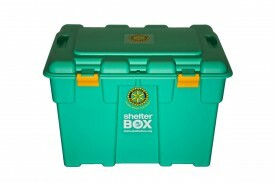 Shelterbox was started in 2000 by the Rotary Club of Helston-Lizard in Cornwall, and some 143 crates of emergency aid containing tents and cooking pots were sent to Gujarat in Jan 2001. In 2004 the Tsunami which hit Thailand was a catalyst, and the recently formed charity sent 17,000 boxes out as emergency aid. Over the years the contents have evolved and includes a tent for a family of 10, groundsheets, cooking pots, solar lights and water carriers. Shelterboxes – a familiar green box – are held in forward depots around the world waiting for the next disaster to strike, and can be on site within 48 hours. The charity is now a formal partner to Rotary International. Responding to a question from David Smith, Chair of the International Committee, Keith told the club that over the years Warwick Rotarians had bought a total of 14 boxes at £590 each, and part funded another 6. Records are kept of where each box has been sent, in 2013 boxes went to North Korea and Sudan, prior to that Haiti, Pakistan and Burma, and many other locations. Recently in the Philippines after Typhoon Haiyan the contents were varied to include tarpaulins, hammers and nails so people could repair their homes rather than live in a tent. To date over 50,000 boxes have been sent worldwide, housing 500,000 people. Currently Malawi is experiencing flooding and boxes are being sent there to relieve homelessness. Donations are welcomed and the charity needs volunteers to pack boxes, deliver the aid, and to spread the message. Young Shelterbox works with children and schools to send aid to the children affected by disaster.